He began with a post-punk, but his musical journey soon moved away. Already in the early 1990s, the name Vladimir Hirsch has become a solid and significant part of our and, in turn, European electronic music. In Prague, the composer and medical doctor have released more than thirty albums, either solo or as a member of Der Marabu, Skrol, Aghiatrias, and others. He is remembered as a man who invented the concept of integrated music, a ground plan on which continuously and originally interconnects the influences of industrial, dark ambient and classics. However, Vladimír Hirsch's musical and compositional span is much broader, as will the following interview, which emerged shortly before the release of a new album of one of his Subpop Squeeze project. The Subpop Squeeze project is described as a more entertaining face of your production. Does that mean you're here to relax and clear your head from musically harder topics? Even so, it is a reflection of the fact that rock principles are still close to me, and I need to move around them at times, even though they may be talking only in the broader outlines of this type of my work. Since 1996, when I initiated the project, and rather as a studio alternative, I paid attention to it only marginally, and for almost fifteen years I did not think about it. Until recently - somewhat overwhelmed by standard concert productions - I decided to reanimate it so that it could be presented live, connected with other works and was something more than relaxing side creations. Your albums are often based on a particular concept or topic. Is it the same thing about an Anacreontics, or is it a free collection of songs? Free collection of songs is not my style of working, the album is usually considered to be the only song in its own way, where its individual parts correspond not only to the way in which it is usual but also thematically. Quite often, it is a story, a whole of epic character, but in this particular case it is not a coinciding factor, they are ironizing paraphrases of topics inspired by the forgotten ancient genre of poems of love and wine. As you talked about, you mentioned the important role of producer Tom Saivon. What would Anacreontics be different from without his presence? Tom Saivon focuses on dramaturgy and sound. Several pieces have been created at his impetus to revive the collection and give things within the theme more diversity and the most dynamic course. I'm not a friend of the genre drawers, but I like Tom's album characteristic as "electro-industrial-thrash metal synthesis," where the proportion of the guitar component - however more or less the sound manipulated - can be seen as a result of that influence. Tom Saivon has been producing some of your albums for years with you in the Skrol ensemble. On the one hand, it brings the advantage of mutual trust, you know what to expect from each other. Can you also prevent co-operation not threatening the stereotype? Our attitudes are not and have never been the same, even though there is trust between us. The producer's view is, therefore, a priori view from a different angle, which gives me, which is completely immersed in the matter, a distance, the possibility of seeing the thing from the outside, discovering and revising the mentioned stereotypes and, alternatively, offering alternative solutions to specific issues. In principle, we approach each new album in order to achieve the strongest possible result in the essence of the message. However often, on the basis of a sharp confrontation, we will usually come to a solution that we both can accept for ourselves without having to consider it a mechanical compromise. This is the very thing I appreciate most about this collaboration. You've got decades of composing and recording, and you're not questioning the role of the producer; on the other hand, some of your production goes without it. What is the key to deciding where the presence of a producer is desirable and when not? The producer is often a medium of commercial success for the record, which is not the same case of our cooperation. I am used to working without his production in all that part of my music that moves in the narrower sphere of contemporary classical music. If the product is intended for more integrated, electronic, industrial or similar sound characteristics form, the producer's role is more significant. This is due to his focus, the practices of classical music are not close to him. This, however, does not mean that he only focuses on the above-mentioned forms, it is about the overall homogeneous and convincing form of the resulting shape, to which aim is all subordinated. 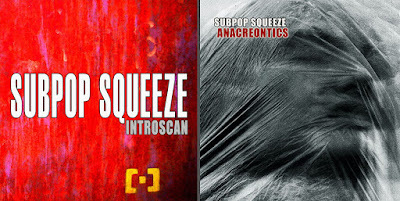 With Subpop Squeeze, you've performed live several times in recent months. Will you continue this? 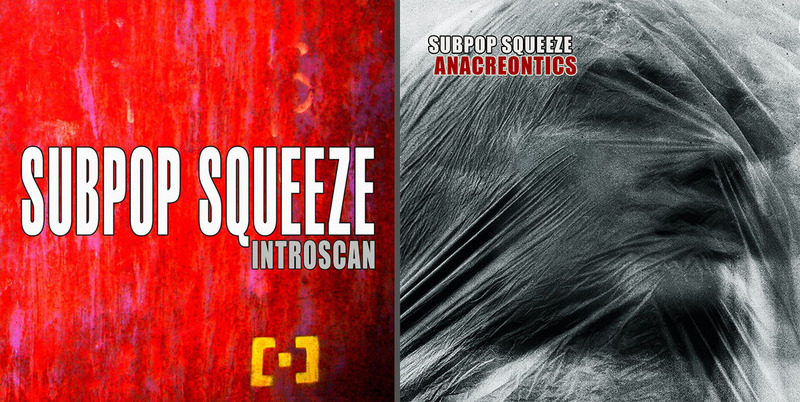 I have been performing as Subpop Squeeze since December 2014, and as a new album was made, I also changed the concert program by replacing older songs with new ones. At the moment, I would like to present live the final version, planning to perform in Czechia, Poland and Germany and maybe also in other European countries that are in the process. Among the cult projects you've found belongs Skrol. What does their future look like? The Skrol band has not officially ended its existence but it is inactive for a long time. We last performed live regularly in 2011 and 2012, from which shows a live mini-album was created. We have enough material to work on, but timeliness, along with other purely practical reasons, hinders us in concrete plans, even though we definitely do not resign on concert production. Even in my solo production, where the instrumental component plays the most important role, it is not the exception of using the vocals, just the opposite. Sometimes, however, I change their sound properties using technologies so much that they are not read primarily as a vocal party. Nevertheless, the collaboration with a number of vocalists (or rather female vocalists) confirms the importance of the role of human voice in music. I use a spoken word in many cases, as is the case with the new Subpop Squeeze album. Speech as such I consider to be a musical expression, its rhythm, tone, and color is an essential element for me and a contribution to the musical message. And are vocals and vocals in the creation of songs for the Skrol dominant, or should they accompany and complement the instrumental component? All the Skrol songs were based on the original instrumental base, which in many cases also acts as a stand-alone unit, some albums have their full instrumental alternatives. The vocal component of Skrol was practically always playing the role of an instrument but not just to accompany it. Although some of Skrol's songs are not accompanied by a vocal part, in others there can be no doubt that Martina's rich, expressive and emotionally exerted expression is not only a complementary role. On the contrary, these pieces form a kind of core and the most important parts of the board. It is always a matter of development, sometimes the vocal part takes on a partially dominant role - nevertheless, the goal has always been a complexly compact matter, no matter what role that element plays. Your solo album Scripta Soli is also in process. How far are you? I've been working on Scripta Soli for a long time. This is a relatively large title, based on work with field recordings that have been gained over several years. The essence of the project is the transformation or the musicalization of the originally seemingly non-musical form. It should be a very ambient album, certainly the quietest of my products, but it also seems to be the most practical. Since it requires a very specific type of work and concentration, I am waiting for a moment when my time allows me to devote myself fully to it. At present, about half of the material is processed. Musically you deal with serious topics - emotions, different aspects of human action, religion, history, and being, play an important role. But electronics and other instruments have their sound boundaries as well. Do you often say that you have to come to a compromise between the idea of how the emotions or feelings in the composition sound and what are the technical possibilities? Working with the sound is the essence of the vertical division of the composition and offers a plethora of solutions. However, it must be stressed that even the most sophisticated technical possibilities do not give the musician comfort, everything is, or must be, guided by him. Technology is a good servant, but a bad lord. Either you who rules or you manipulate yourself. In this case, a perfect trap will slip. It happens that I fail to realize my idea, but I see it as my own imperfection, not as a technical problem given by the limitations of instrumental and instrumental sound sources. I am not limited by them, the source or the inspiration can, in theory, be any hearing perceptions that surround us. The musician can sink into a microscopically consistent work on a single sound or moment - when do you know that this is the ideal and ultimate state and can be continued? I prefer complexity. The sound characteristic, however important and significant to me, is not the only attribute of the song. I always understand it as a relationship between detail and a whole. If I find compatibility, consistency, and testimony of authenticity, I can go on. I assume you are not only a musician and composer but also a listener. 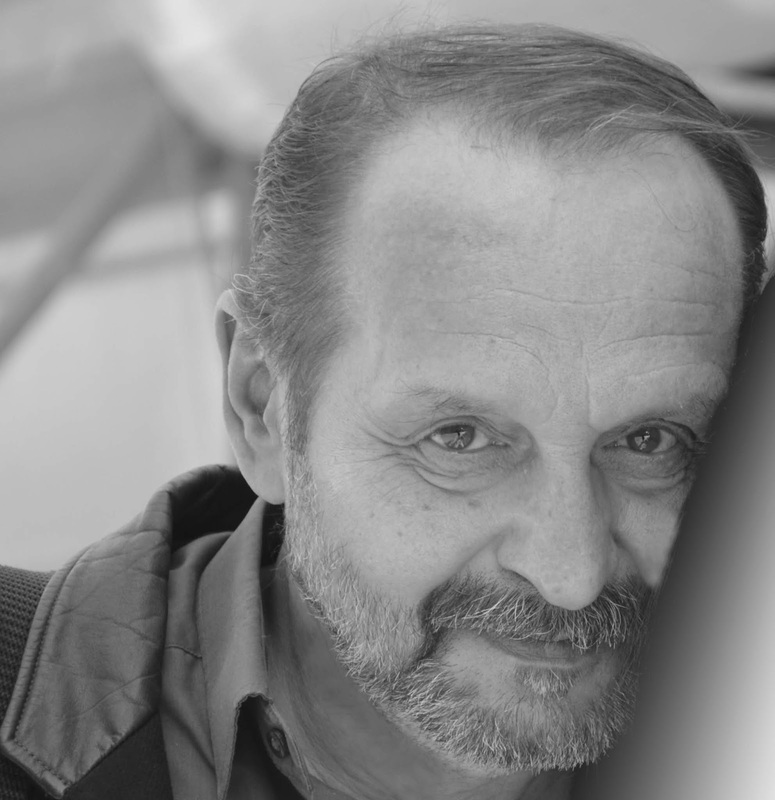 What lately did Vladimír Hirsch enjoy most in music? Recently, it was a great pleasure for me to finally record all the symphonies of my favorite composer, Miloslav Kabeláč. I am not completely enthusiastic about some versions, but it was filled with a shameful gap in the discography of Czech modern classical music and its prominent representatives. 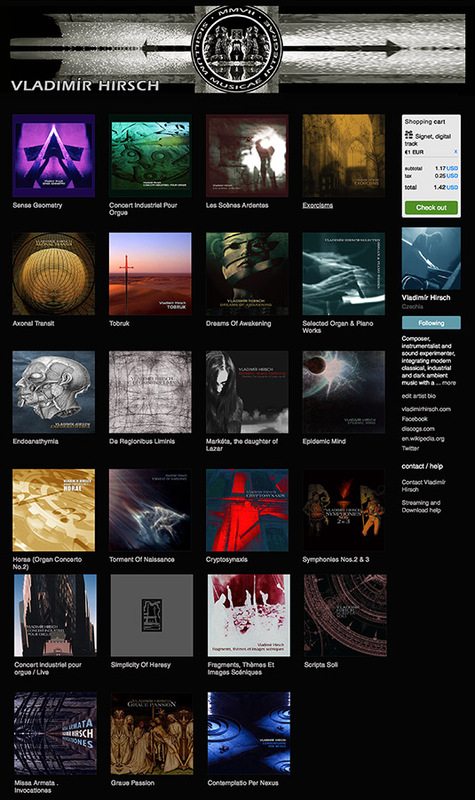 Bandcamp pages of the composer, instrumentalist and sound designer Vladimír Hirsch, integrating modern classical, industrial and dark ambient music with a genre overlap conception. Besides creating solo works, he is the leading personality of bands and projects Skrol, Aghiatrias, Zygote (CZ), Luminar Ax, Subpop Squeeze, and Tiria, the former member of experimental post-punk group Der Marabu. Quora: "What the biggest contribution of Czechia to the world? The Czech Republic´s existence is only 25 years long and there is not anything special or substantial contribution to the world in the period between 1993 and today in my opinion. 2. Arts - in general, the Czech art is known worldwide for its individually made, mouth blown and decorated art glass and cut crystal, garnet and other gems jewelry, decorative and applied art. Painting: works of the Gothic era - Master of Vyšší Brod altar, the founder of the style, which dominated European painting around 1400. Baroque - An exceptional Czech artist Václav Hollar, the etcher of worldwide recognition. Art Nouveau and modernism - Alfons Mucha, world famous and one of the best known Czech artists. Abstract painting - František Kupka: a pioneer of abstract art, influencing substantially all modern painting movements. Interesting personalities in expressionism, cubism, and Cubo-expressionism, original post-war symbolism (Mikuláš Medek) and “explosionism” movement (Vladimír Boudník). Film and theatre: Karel Zeman, a pioneer with special effects (culminating in successful films such as artistically exceptional "Vynález zkázy" (A Deadly Invention, 1958); so-called Czech New Wave of the 1960s (linked with names of Miloš Forman, Věra Chytilová, Jiří Menzel, Ján Kadár, Elmar Klos, Evald Schorm, Vojtěch Jasný, Juraj Herz, etc.) and director František Vláčil with the original manuscript and the deep psychological impact with the extraordinary high-quality art received international acclaim; Jan Švankmajer - a filmmaker, known for his animations and features, which greatly influenced artists worldwide. Original Czech cultural phenomenon came into being at the end of the 1950s. This project called Laterna magika (The Magic Lantern) considered the first multimedia art project in international context. 3. Literature - Comenius (philosopher and writer), the innovator who first introduced pictorial textbooks, F.Kafka - widely regarded as one of the major figures of 20th-century literature, humorist J.Hašek (The Good Soldier Švejk - the book which was translated into 60 languages). Names as B.Hrabal, K.Čapek and M.Kundera cannot be forgotten. Poetism - Czech literary avant-garde style and movement in poetry (main representant Jaroslav Seifert, Nobel Prize holder). 4. Architecture - Czechia is the country with rich architectural heritage from the Romanesque period until modern times, being the place of origin of several unique styles - unique mixture of Romanesque and Gothic style represents St. Procopius Basilica in Třebíč, considered to be the most bizarre work of the European architecture of the 13th century, Czech Baroque due to its complexity and uniqueness became an independent concept art history, an architectural singleton is the Baroque Gothic style (Jan Blažej Santini), a specifically Czech architectural style, called ‘Rondo-Cubism’, came into existence after 1918. Together with the pre-war Czech Cubist architecture, it is unparalleled elsewhere in the world. There are also contemporary Czech architects whose works can be found all over the world, e.g. works of Jan Kaplický. 5. Science - Prokop Diviš: lightning rod inventor; Jan Evangelista Purkyně: anatomist and physiologist of the first half of 19th century, discoverer of Purkinje cells in the brain (1837), was the first to use a microtome to make wafer thin slices of tissue for microscopic examination. He is also known for his discovery in 1839 of Purkinje fibers, the fibrous tissue that conducts electrical impulses from the atrioventricular node to all parts of the ventricles of the heart. Other discoveries include Purkinje images, reflections of objects from structures of the eye, and the Purkinje shift, the change in the brightness of red and blue colors as light intensity decreases gradually at dusk. Purkyně also introduced the scientific terms plasma and protoplasm the substance found inside cells. He was one of the best-known scientists of his time. Josef Ressel: ships propeller inventor. Gregor Mendel: the founder of the modern science of genetics, in Czechia born and working; Bedřich Hrozný - orientalist and linguist who deciphered the ancient Hittite language and laid the groundwork for the development of Hittitology. Sigmund Freud, neurologist and the founder of psychoanalysis; Jaroslav Heyrovský: the inventor of the polarographic method, father of the electroanalytical method. Otto Wichterle - inventor of soft contact lenses. Stanislav Grof: founder in the field of transpersonal psychology; Antonín Holý - chemist of world recognition, inventor of the most effective drugs in the fight against the AIDS epidemic. 8. products - Czech beer, worldwide known product of Pilsener (Plzeň/Pilsen - the city in the western part of Czechia) types of beers brewed by original technology using Czech raw materials (Bohemian hop); Bohemian glass - glass products made by original technologies, cutting-edge design and inimitable craftsmanship (incl.co-called Bohemian crystal - hand cut glass products). porcelain and jewelry, using own raw-materials, e.g.Bohemian garnet in the jewelry; Tamara and Věra radar system (passive sensor) of third generation, able to recognize targets of “stealth” type; Semtex worldwide known explosives; some original products of the Czech cuisine - above all pastries (salty and sweet as “koláče” & “buchty”), Czech finger sandwiches, Prague ham: a type of brine-cured, stewed, and mildly beechwood-smoked pork boneless ham, Shpikachki (špekáčky) - type of sausage, made from finely cured mixture of pork and beef with smoked bacon liner, Bohemian breaded dumplings, pickled sausages (called “utopenci”, which means “drowned”) and fishes (“zavináče”), cheeses and vegetables (well known Znojmo pickled cucumbers), beer cheese, ripened cheeses (well known “Olomoucké tvarůžky” etc. ), Czech potato pancakes, etc. ; liquors - Wallachian “Slivovice”: strong plum brandy and “Becherovka”: sweet herbal liqueur from Karlovy Vary. 10. Sportsmen - football: Josef Bican, the greatest goalscorer of football history in Europe (and probably in whole world), Emil Zátopek - long-distance runner, only person to win the 5,000 metres, 10,000 metres, and marathon in the same Olympics, Věra Čáslavská - seven Olympic gold medals holder in gymnastics, all in individual events, which is an all-time record among female Olympians, Martina Navrátilová - tennis player, arguably the best female tennis player of all time, multiple winner of women's singles title at Wimbledon, Jaromír Jágr - ice hockey player, the best European player in the history of Canadian-American National Hockey League, ranking overall 2nd in points, third in goal scores, and first in the number of game-winning goals in all history of NHL.